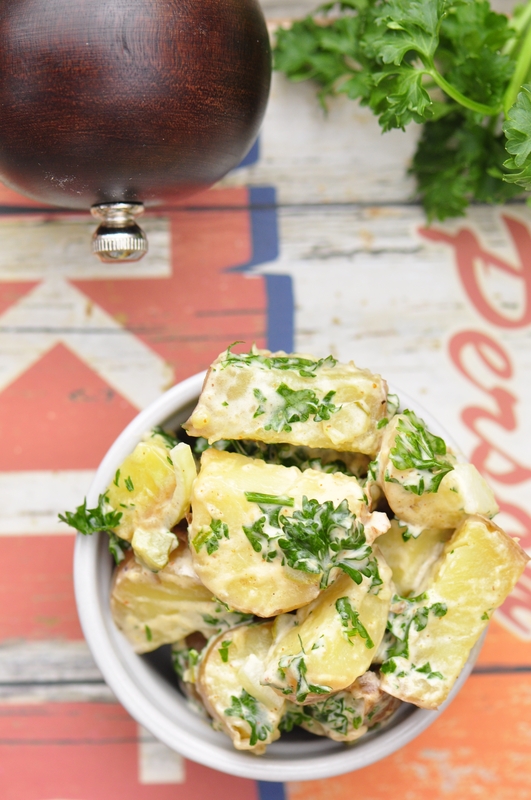 Potato salad is really versatile in a few ways. First of all, you can put in almost any type of spices, herbs and veggies and it will still carry a nice flavour. 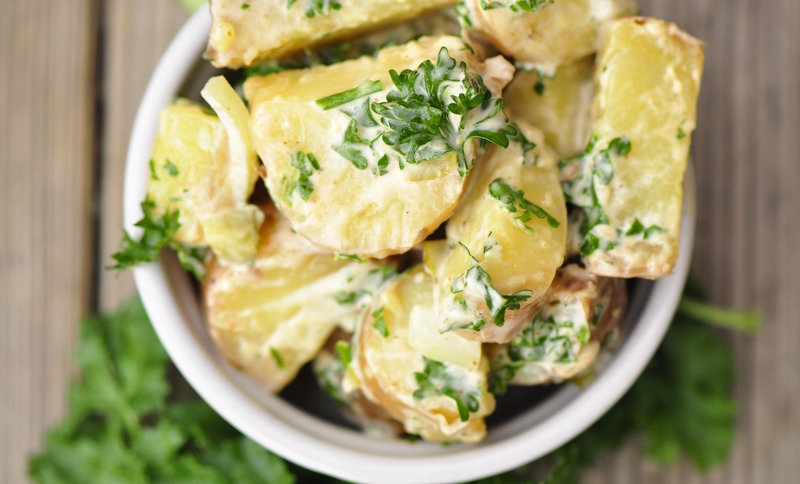 Secondly, potato salad can be eaten on its own or used as a burger topping (which is one of my preferred ways of eating it). Skip the typical barbecue toppings of relish (I’m sorry, relish is gross) and go straight for this creamy, flavourful topping that won’t disappoint. The cook time on the potatoes may vary depending on which type you choose. I used smaller purple potatoes, so they took less time than a regular larger potato would. Also, I used a little too much onion for my liking in this recipe, so feel free to tone in down depending on your preference. I was super excited about this whole “purple potato” thing but when I brought then home I found out they were just purple-skinned potatoes (boo). Also, when I boiled them a lot of the colour sort of washed out. Just in case you’re reading the title and questioning my sense of colour. Sidenote: A couple of months ago, I tried this awesome vegetarian Jamaican roti at One Love (spiced Jamaican pumpkin filling). I find it’s basically the only place of its kind in the city, and the more I try it, the more I want to learn how to make it. Any tips? Bring a large pot of lightly salted water to a boil. Add the potatoes, and boil until you can easily insert a fork into them, but they’re not mushy (about 20 minutes). Drain, rinse in cold water, cut in quarters, and set aside in a large bowl. Add in red onion, celery, parsley and dill. In a separate bowl mix together the mayonnaise, sour cream, mustard, cayenne, paprika, vinegar, lemon, sriracha and pepper. 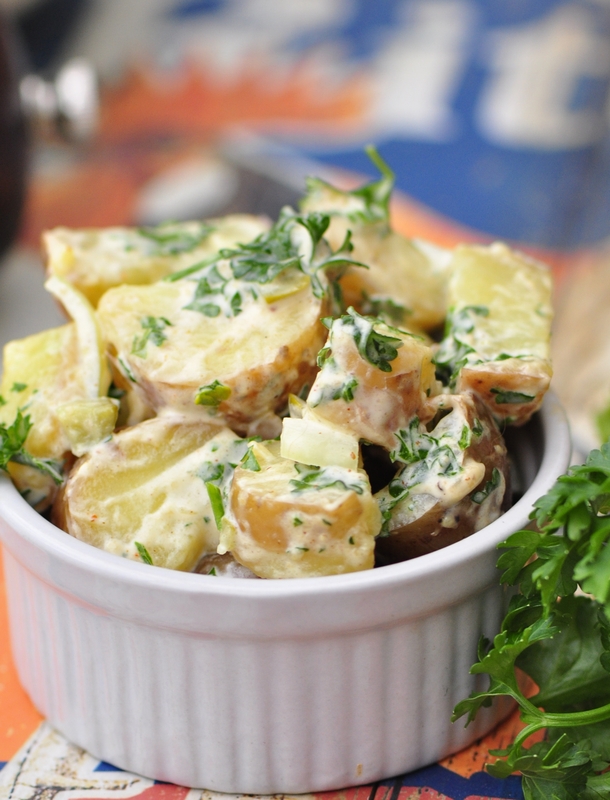 Once well combined, gently toss the dressing in with the potatoes. Allow to sit in the fridge for 20 minutes to allow flavours to develop, then serve as a side or topping. Nice and simple and simply wonderful!